In 2015, Foundation Cigar Company splashed onto the craft cigar scene with their breakout hit, El Güegüense, which was critically acclaimed and earned multiple placements among the industry’s top-ranked cigars of the year. The name El Güegüense is a Nicaraguan term, meaning “The Wise Man,” which is named for Nicaragua’s famed theatrical play of the same title. As such, the cigars showcased Nicaraguan influence through and through, offering a Nicaraguan puro blend and artwork inspired from the colorful costumes of the El Güegüense traditions. But if the El Güegüense cigar could be considered Foundation Cigar Company’s “yin,” the cigar would surely require the proper “yang!” El Güegüense receives the much-deserved followup with The Wise Man Maduro, a Nicaraguan-based blend that is finished in a luscious, Mexiacn San Andrés maduro wrapper. 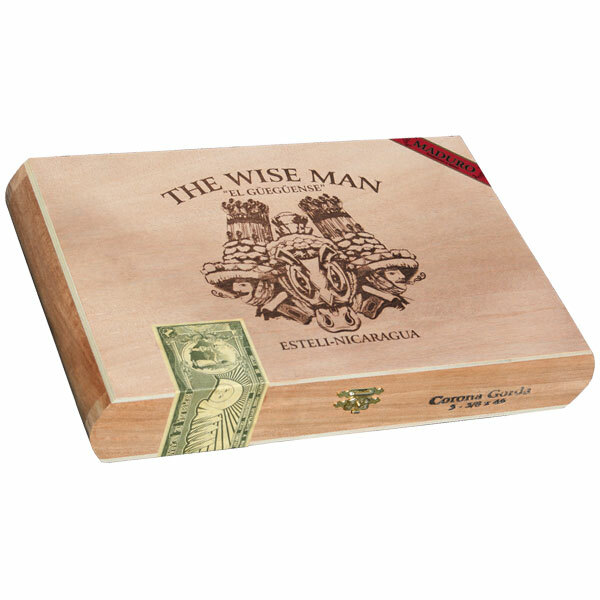 The Wise Man Maduro features the same artwork as the original cigar, only swapping the blue color layout of the original for a new, red appearance. The cigars are rolled at the very same TABSA factory, using a Nicaraguan filler (Condega, Estelí, and Jalapa), Nicaraguan Corojo ’99 binder from the Jalapa region, and a dark, San Andrés wrapper. Experience a medium-plus body and full flavors of black pepper, espresso, cocoa, and sweet, roasted nuts—a maduro fanatic’s ideal scenario!